Reflecting on Euromillions history, the sweepstake was conceptualized by executives employed at Francaise des Jeux, national lotto operator of France in 1994. However, the concept, heavily borrowed from US state-level lotteries, took another decade before it was launched finally in 2004 on 13th February. 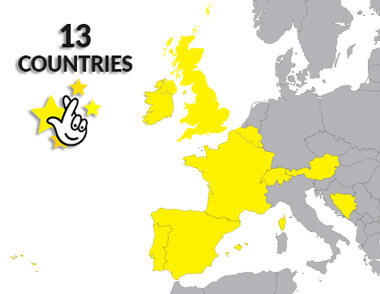 In the beginning Eurolottery draws were open only to participants from Spain, France, and UK. However, from October 2004, players from Switzerland, Portugal, Luxembourg, Belgium, Austria, and Ireland started participating in the Euromillions sweepstakes. The 1st winner was a French player who claimed a prize of €15 million. Ever since the lotto has seen several introduction and changes made to it each year. Be it the format or the kind of draws that were available, it has been a long and wonderful journey till date. Euromillions, in the very year it was launched was a whopping success, thanks to large jackpots won in a series. Nevertheless, it was only in July 2005 when the top pan-European purse hit the £68,000, 000 or € 1,00,000,000 score. The draw on 29th July 2005 had rolled over to a huge purse of £79,881,799 which was claimed by an Irish participant playing on a single ticket. SuperDraws, a special type of sweepstake were introduced in Euromillions history in February 2007. In SuperDraws, extra funds to the tune of €100, 000, 000 or £86, 000, 000 are put in the jackpot kitty, irrespective of the latter’s purse value. More often than not, these guaranteed SuperDraws have peaked at £112,000,000 or €130,000,000. From November 2009, UK Euromillion players were required to £2.00 (instead of the previous fee of £1.50) for choosing a specific line of numbers. However, the extra charge also enabled ticket holders to take part in Millionaire Raffle Eurolottery that guaranteed to threw up a millionaire in every such draw. A ceiling on the jackpot prize also became effective with the introduction of Millionaire Raffle and an increase in the ticket’s price. A booster prize came into force from May 2011 to ensure the guaranteed availability of the opening jackpot of £13, 000,000 or €15,000,000, poor ticket sales notwithstanding. In case, this booster fund was not used up for financing the initial jackpot, it was made available for SuperDraws and other special sweepstakes, thereby ensuring that jackpots never drew a blank. The debut draw in Euromillions history took place on 13th February 2004 which was a Friday and was billed as ‘unlucky Friday’. Only French, British, and Spanish players participated in the sweepstakes. Marion Richards who won a total purse of £16.7 million created history by becoming the winner of the UK Euromillions. After 8 months, in October, the Euro lottery became open to players from Switzerland, Belgium, Austria, Ireland, Portugal, and Luxembourg. On 12th Jan 2006, the limit of the rollover was capped at 11 meaning that if no clear jackpot winner emerged in the first 11 rollovers, the jackpot rolled over to the subsequent tier. Ireland on 15th June 2007 introduced Euromillions Plus in which participants by paying an additional €1 could partake of in an additional jackpot draw with a purse of €5,00,000. In November 2009, the jackpot was capped at €185 million. This was to substitute for the rollover ceiling with the objective that the increased upper limit would leave enough money in the kitty even after the jackpot was claimed. Simultaneously, the ticket price of the UK Euromillions draw increased to £2.00 from £1.50 for players selecting a particular set of numbers, lying in a straight line. On 10th May 2011, the first Euromillions draw was held that had a jackpot taking of €100 millions. Also, the total number of the Lucky Stars went up to 11 from 9 as well as a purse for tallying any two chief numbers was announced for the first time. In 2011, on 12th July, Christine and Colin Weir of Ayrshire became the first couple to pocket the Euromillions jackpot cap of €185 millions or £161.1million. Till date, the amount is the biggest ever prize to be won in Euromillion draw history. From 12th July 2011 onwards, the jackpot ceiling was raised to €190 million. In the weeks leading to the Yuletide in 2011, a total of 50 individuals claimed the millionaire Raffle prize. In 2012 January, it became official that the jackpot would remain capped at €190 forever. Furthermore, up to a maximum of only two draws would be permitted at the starting level following which the top purse automatically passes on to the next tier. To conclude we can say that Euromillions has become a platform that is not only popular regionally but across the globe. The enormous amount of winners clubbed with the ever increasing winning amounts has always been a major driver. Playing it online is very simple as it basically requires a person to buy their tickets online and tallying it on the date of the draw right from their homes. Hi lottery fans i was a poor man who had never find luck when it comes playing lottery. i have been playing lottery since my early 20s and now i am 48 years. And it says he’s the best when it comes to winning lottery. This man is a very strong voodoo doc who gives out the numbers that can never be complicated. After all my years of laboring and struggling to win the lottery i finally won £750, 000…. if you are a lottery fan and you need to win you can send him email right now marvelspelltemple@gmail. com his contact Check….